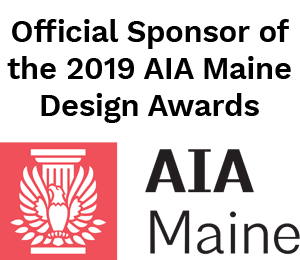 In Raymond, a contemporary riff on Maine camps takes its cues from a treasured waterfront site. 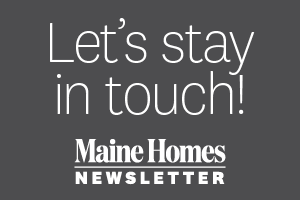 On Sebago Lake, undeveloped lots with good swimming potential and sunset views can be as elusive as the loons that glide through the water. You might hear about a prime property, only to have it disappear before you can see it up close. 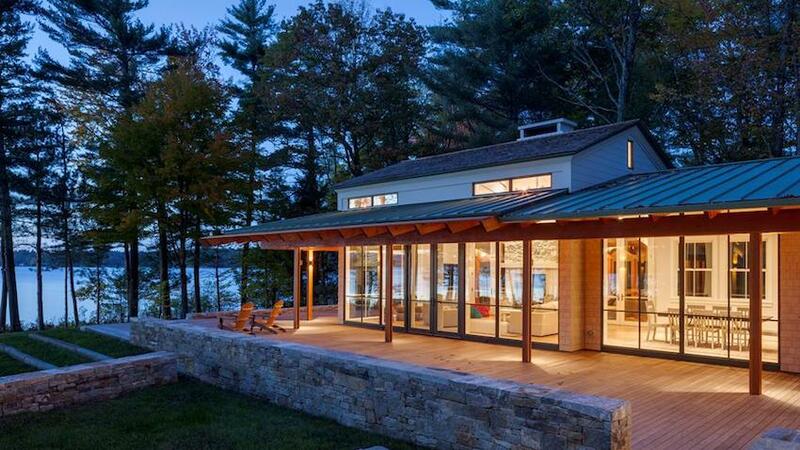 How, then, did the Boston-area couple at the center of this story secure their gently sloped, west-facing slice of waterfront in Raymond? 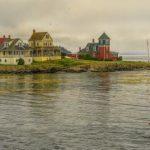 “Luck,” says the husband, who began looking for property after the couple and their three kids vacationed in the area and acted quickly on a tip from a real estate agent. “We know now how long people here wait for the right piece of land and how fortunate we are,” he says. 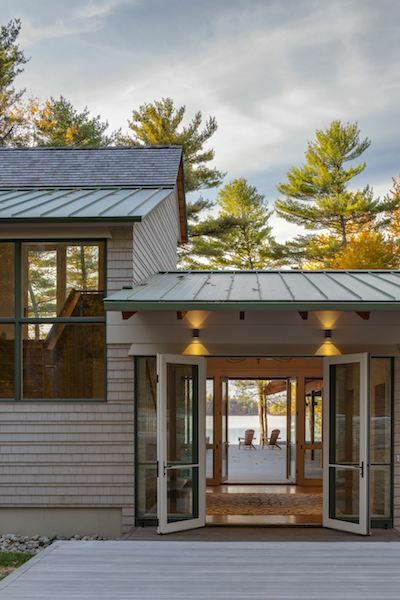 To realize their vision of a camp that communes with the prized site, they turned to Boston architect Jeremiah Eck, FAIA, and Portland’s Wright-Ryan Homes, who created an artful, cedar-and-glass structure with ample opportunities for taking in the activity — and melodious luh-hoo-hooos — on the lake. 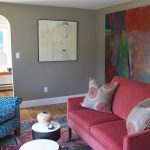 “There’s a party side of the house and a private side,” says Wright-Ryan Homes project manager Andy Seymour of the building’s compound design. 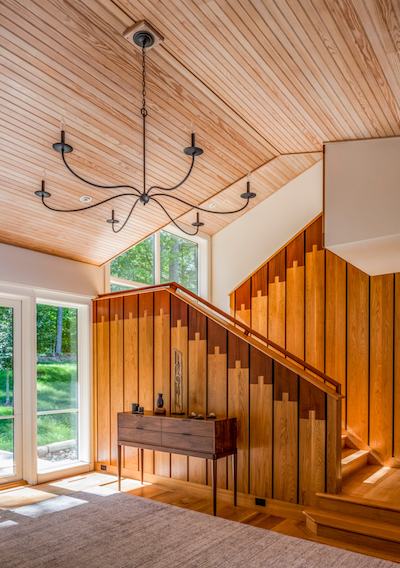 A glass entryway connects the primary living spaces, contained in a cathedral-ceilinged volume lined with 10-foot-tall windows, with the bedroom-office wing at the other end. 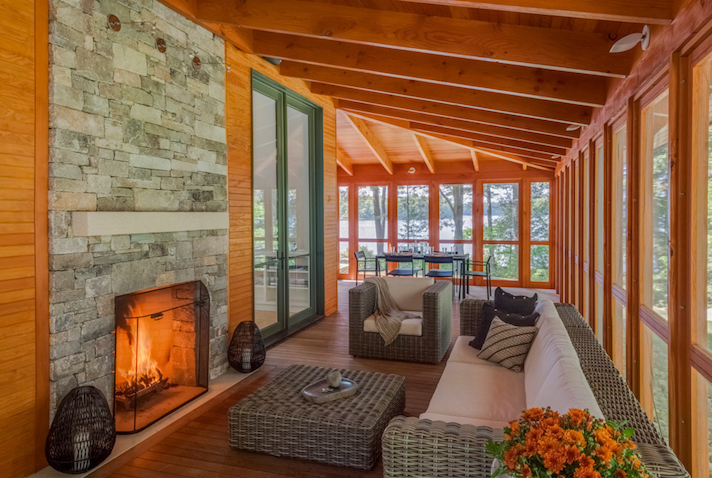 Stained white-cedar shingles, mahogany framing, and large windows that reflect the property’s mature pines and oaks unify the structures. Bending the building into an L-shape enabled architect Jeremiah Eck to delineate an outdoor living area with a courtyard set off by stone walls and a partially covered ipe deck that stretches from the entry to the screened porch seen at far left. The homeowners contacted Eck after seeing a photo of a pass-through window flanked by counters in another house he designed. “That epitomized the kind of casual, indoor-outdoor feeling we wanted to create,” says the wife. 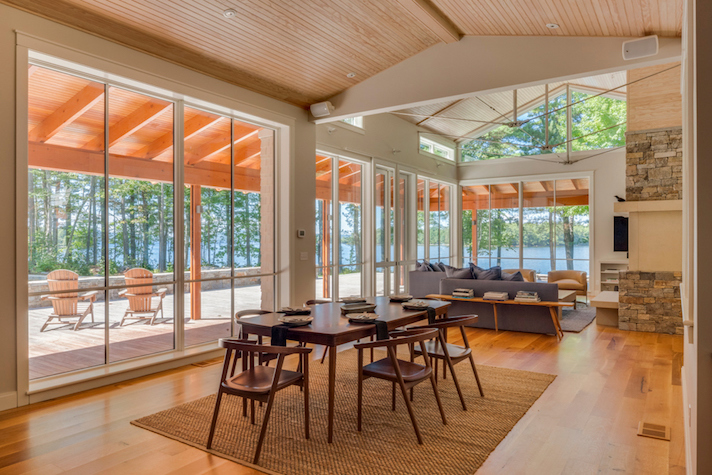 Situated between the kitchen and a corner of the porch, the window is angled to allow for western views of the lake; a wide mahogany trellis topped with standing-seam metal roofing shields the southern sun. 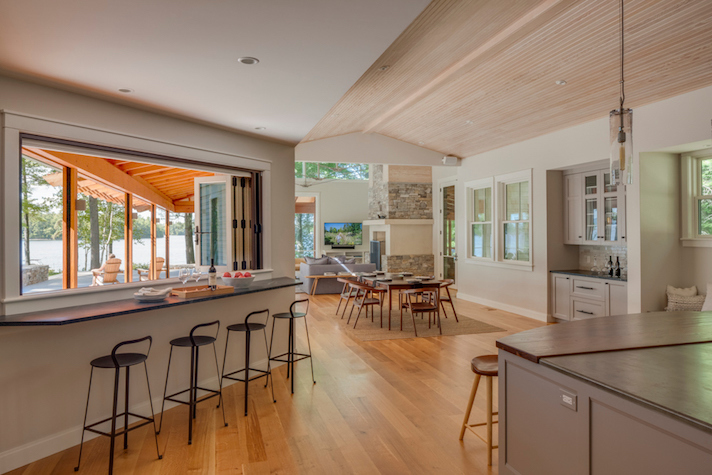 Varying ceiling heights subtly define the rooms in the open plan and allow for progressively more glass — in the form of transoms and a massive gable window — as you move from the dining area to the living space beyond. Rustic-grade, stained white-oak flooring, used throughout the house, provides a quiet counterpoint to the whitewashed Douglas fir overhead. In the kitchen, a hand-scraped walnut panel helps break down the scale of an earthy, zinc island top. 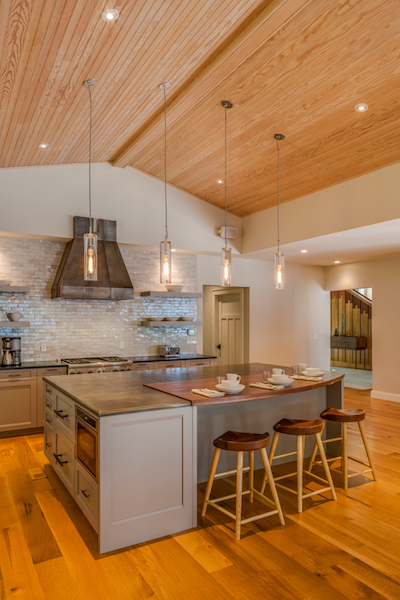 The unsealed metal, also seen on the custom range hood, “has a lot of character,” says Seymour. “It oxidizes and shows glass rings and fingerprints, which is what the family wanted. They didn’t want to live in a museum.” Clear-glass pendants and a shimmery hand-glazed ceramic tile backsplash provide a glam contrast to the patinaed materials. The trellises that skirt the home encompass an expansive screened porch at the northwest corner. 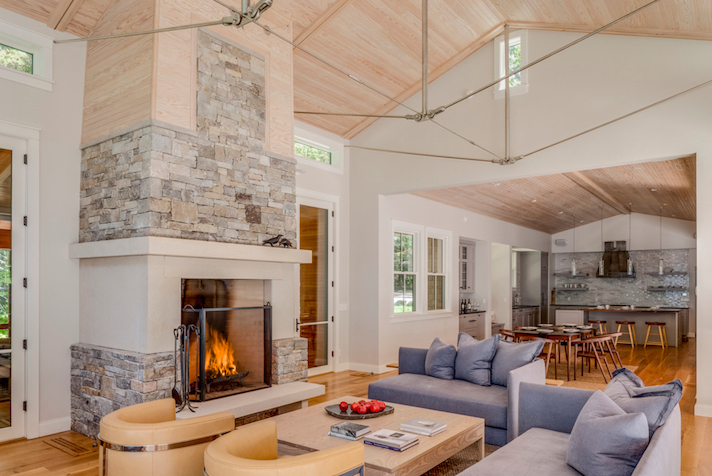 Natural fir paneling, stained ipe flooring, and the double Rumford fireplace (rendered in grander fashion on the living room side) create coziness in the family’s favorite area of the house. 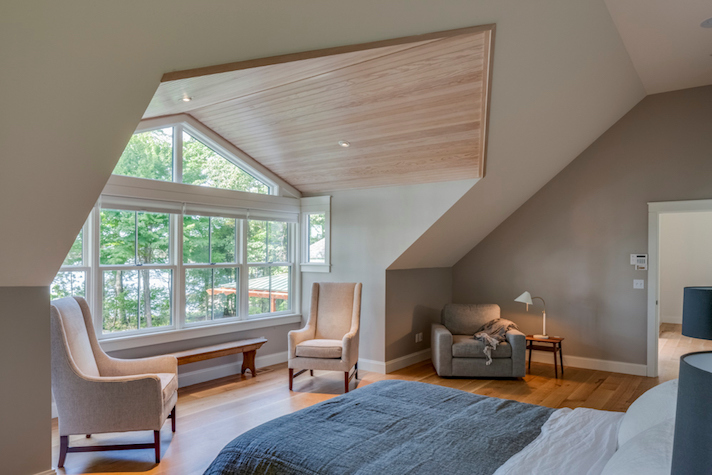 A massive dormer in the owners’ suite ushers in the woodsy-watery view and defines a seating area. White-oak flooring and a section of fir paneling pick up on themes seen elsewhere in the house. On the driveway side, an ipe walkway resembling a dock lures visitors toward a pair of Adirondack chairs that appear perched within toe-dangling distance of the water — an illusion they surely won’t mind when they take their seats before the great expanse of lake sparkling through the trees. Stunning project. A beautiful home in a pristine spot. I couldn’t agree more. Thank you for the kind words, Stephen. Sigh, me too, Linnea! This team did amazing work.